Coming soon to an outfield near you? The regular season isn’t even over yet, and already the off-season rumors are starting… which is not surprising in the least, really. But it’s drawing some attention in Houston today as the Boston Herald has linked one of the biggest names in this year’s market to the Astros. Let me start off by saying that I will be VERY surprised if we see Carl Crawford in an Astros uniform next year. If he doesn’t stay in Tampa, I expect he’ll be lured away by the deeper pockets of the Angels or Yankees. Plus Crawford went on record recently saying that he loves the city of Houston, but “the Astros are not really winning right now,” and his friends “want to see [him] on a team that’s winning.” The Astros and their 33-18 record since July 27 can argue against that, but I’ll be surprised if their efforts are successful. I’ll be surprised, but I’ll also be surprised if they don’t at least make Crawford an offer. 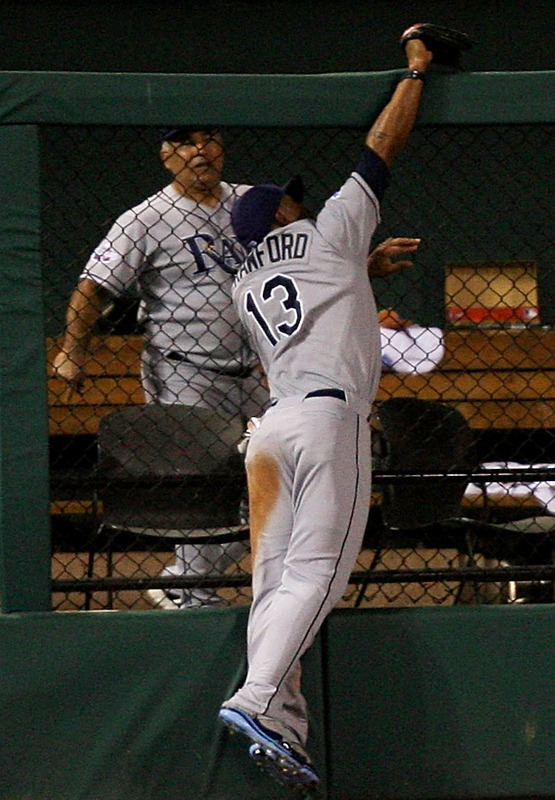 The biggest barrier standing between Crawford and the Astros isn’t money; it’s Carlos Lee. Or maybe it is money, due to Lee’s contract and the difficulty that Ed Wade is certain to have in trying to get rid of it. While Lee has somewhat redeemed his season in the second half, he’s still unlikely to be worth the money he’s owed on the remainder of his contract – at least to a National League, non-DH team. His no-trade clause expires after this season, but he’ll fall into MLB’s 10/5 no-trade category if he spends next year in Houston, so it’s likely now or never if the Astros want to unload him. They’d be foolish not to try. The good news about Lee’s offensive improvement since the All-Star Break, besides the fact that he’s helped Houston win a few games, is that he’s not quite the “most untradeable player in the history of untradeable players” any longer, as Alyson Footer once put it. Some AL team ought to be willing to take a chance on him as a DH, if Houston eats a portion of his salary; I honestly suspect that his being played at 1B is an attempt by management to increase his market value, as well. Ed will still have his hands full attempting to move him, but I think it can be done. If they can find El Caballo a happy new home, then Carl Crawford starts to make a lot more sense. Trading Lee’s -1.6 WAR for Crawford’s 4.4 instantly makes your team 6 games better. An outfield lineup of Crawford, Michael Bourn and Hunter Pence would be among the best defensive trios in baseball, which would in turn make Houston’s pitching staff better (especially fly-ball lovers like J.A. Happ). Replacing Lee with Crawford would mean losing 10-15 HRs per season, which is a problem for a team that’s already last in the league in power, but Carl has actually outslugged Carlos this season – .489 v. .425 – and he helps your team win in plenty of other ways. Could you imagine the havoc wreaked on opposing pitchers with Crawford and Bourn together at the top of the lineup? Plus, of course, Crawford is a Houston native and Bourn’s (and Jason Bourgeois’) old Little League teammate. Astros fans would LOVE him. There remains the issue of money. Crawford is likely to command a $100-million, long-term contract, or something close to it… something close to what Houston paid for Carlos Lee, come to think of it. Those kinds of contracts are rarely worth the cost in their final years, but Crawford is two years younger than Lee was when he got his six-year deal, and he’s in better physical shape to theoretically hold up longer. A few months ago, adding any kind of big name free agent this winter would have made NO sense for Houston, as the Astros seemed too far away from contending. But ESPN’s Steve Berthiaume has already predicted an NL Central title for Houston in 2011, and the amazing part is that the possibility really could be there. These Astros have been a non-losing team since June 1 and a winning team since late July, with a cast that is likely to return almost entirely next season. An entire season played at their post-May pace would put them pretty much exactly where Cincinnati is right now. Add a six-game swing like Crawford-for-Lee, and you’re looking at 97-98 wins. That’s good enough for the playoffs almost every year. Drayton McLane likes to show the fans that he’s committed to winning. Signing Carl Crawford wouldn’t quite be like signing Roger Clemens, but it could be close. And if you’re going to spend $100 million on a player, it’s better spent on an all-around talent like Crawford than on a bat-only guy like Carlos Lee. The Astros likely wouldn’t even have to lose their 1st round draft pick next year, as they’re still sitting at #12 in the draft order right now, and all picks through #18 are protected. Those awful first two months this year may end up being the best thing that could have happened to this team. I do have one big caveat to bringing Carl Crawford on board: J.D. Martinez. You’re not going to get Crawford on a two-year deal, which guarantees that he would still be in town by the time you expect Martinez to be ready for the majors. But consider this: Michael Bourn’s arbitration years will be up and he’ll be eligible to hit free agency following the 2012 season. I like Michael a lot, but if he continues to improve, he may price himself out of the Astros’ range by then. You figure that Martinez will start next season in Corpus, then probably move up to Oklahoma City by season’s end. He could start 2012 in OKC, or he could compete for a starting job then – making Bourn (or Hunter Pence) expendable as trade bait to fill other holes. It’s sad to think about either one of those guys leaving right now, but that’s the reason a strong farm system is so important, and that’s how good teams stay competitive for years at a time – replacing old players with new, trading surplus parts to meet needs in other areas. That’s how Houston won four NL Central titles in five years, 1997-2001. So. Wow. What is there for Astro fans to say about the past weekend that hasn’t already been said? Roy was expected, and while it was sad indeed to see him go, at least we had two and a half months to know that it was likely coming. We knew it might happen with Lance too, but I didn’t truly expect that it would until it was already upon us. Losing both him and Roy within 48 hours of each other made their departures all the sadder than losing either one alone. As fan blogger Chip Bailey said, has there ever been a darker weekend in Astros history? I know it was necessary. I know it’s for the good of the team. I know that the Astros are closer today to being competitive again than they were four or five days ago, and I wanted these trades to happen – both of them – before they did happen, or at least that’s what I told myself. But as a lifelong Astros diehard, it still hurts. There was one scary winter in the mid-’90s – 1995, I believe it was – when Craig Biggio became a free agent for the first time. He’d already been an Astro for eight years by that point, but the other teams came courting. The Yankees, in particular I recall, were interested, and New York is Bidge’s home state, so everyone in Houston feared that he would skip town for the Big Apple. That story had a happy ending, as he resigned with Houston, ultimately retiring as a career Astro 12 years later. I dreaded the thought that winter of seeing one of our own in Yankee pinstripes. I know exactly how that feels now. I tried watching Yankees and Phillies highlight reels over the weekend, but I had to walk away. But I dwell too much in the darkness of these deals. I’m happy for Lance and Roy, excited for both of them. I’ll get used to seeing them in opposing uniforms, the same way I got used to seeing Billy Wagner with the Phillies after 9 years an Astro. I hope they both end up with championship rings, as Brad Lidge did two years ago. I’m excited for the youngsters that they’ve brought in, too – J.A. Happ impressing in his Houston debut, and Brett Wallace earning his first big league hit yesterday afternoon. I’m excited that Carlos Lee is the only everyday Astros regular over 30 years old now, and I hope that this winter, Ed Wade will do what he just did twice and take whatever steps necessary to move Carlos out of the way for younger talent to break through (Brian Bogusevic, I’m looking at you). Not that I hate El Caballo like it seems many do these days, but as with Lance and Roy, the team will be better off in the long run if they can move him for almost anything now. I like the Brett Myers extension, even though many wanted him traded too; he’s younger than Wandy, and without many or any additional youngsters ready to step into the rotation right now, his innings-eating tendencies should prove very valuable while the best of the youngsters rise to the top around him in the next few years. It feels like 2010 may be the return of the 1990 Astros – a team that’s been hanging onto players from past glories (’86) finally trades a couple of fan favorites (Bill Doran, Glenn Davis) while a few youngsters are taking over (Biggio, Ken Caminiti). If Wade can move Lee in the off-season and doesn’t make any dumb veteran signings, then 2011 could be the return of 1991, with the oldest regular being a 30-year-old 2B (Casey Candaele vs. Jeff Keppinger). ’91 was a rough year in the standings, but watching all those kids was fun. At least the Astros managed a sweep of Milwaukee while the off-field drama played itself out. May it be the sign of better things to come. At long last, things are looking up in Astroland.